Stable system operations and maximized up-time are vital to the success of any large-scale banking operation. Financial institutions cannot afford to allow disruption of any critical delivery channels, including SWITCHWARE® or EZswitch®. That is why CSFi recommends a variety of options for implementing our solutions to maximize system operations and reduce downtime. Maximizing operational up-time without disruptions! 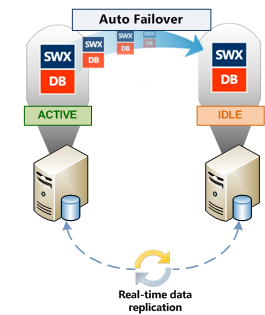 Active/passive application with segregated and clustered databases. This approach, meant for large implementations, segregates the application hardware and the database hardware. The database, which is installed on multiple servers and clustered together, is connected to a separate application server. Where there are heavy volumes of financial transactions, the workload of the database is removed from the application server to allow for faster processing. Meanwhile the distributed workload of the database servers provides high-availability protection because the array of database servers operate in an active/active fashion. The application servers operate in an active/passive fashion, providing failover protection in the event of disruption. 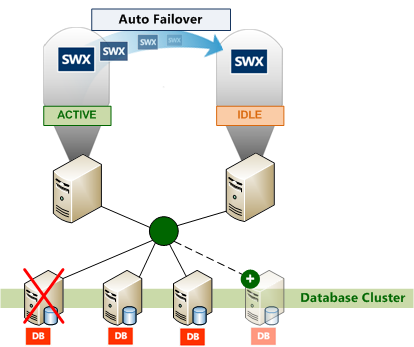 Active/passive with automated fault tolerant failover. Both systems are setup to provide real-time data replication to the other in order to synchronize the transactions on both systems. In this environment, one system actively processes transactions and the second system remains idle but receives database replication updates. In a fail-over event, the idle system is brought online and establishes connection to all nodes to maintain operations. VMware High Availability (HA) and Distributed Resources Scheculer (DRS). SWITCHWARE® and EZswitch® may be installed virtually. VMware offers its own high availability options, where virtual machines can be automatically restored on a another VMware server, or when detecting a fault, it can move the virtual machine from one physical server to another, without disrupting services. With products like VMware HA, DRS and vMotion, high availability can be established transparent to the software solution.